A deep-fried Western Dog from the Coney Dog Cafe at Lima and Dupont roads. 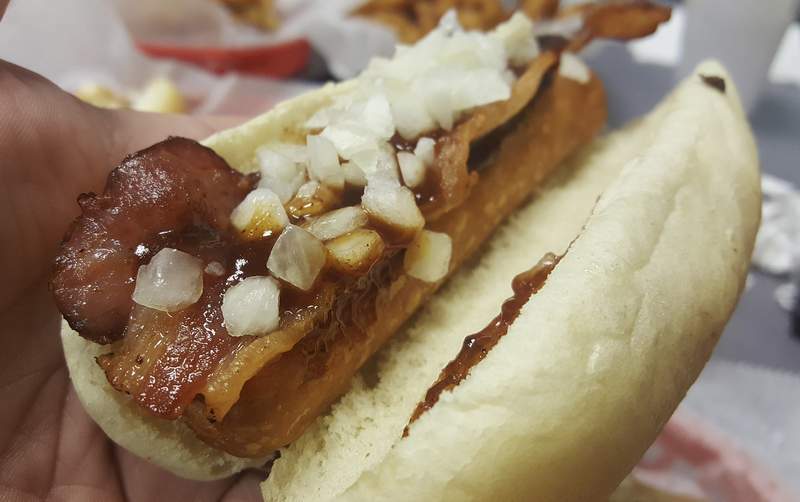 A Chciago dog from the Coney Dog Cafe at Lima and Dupont roads. 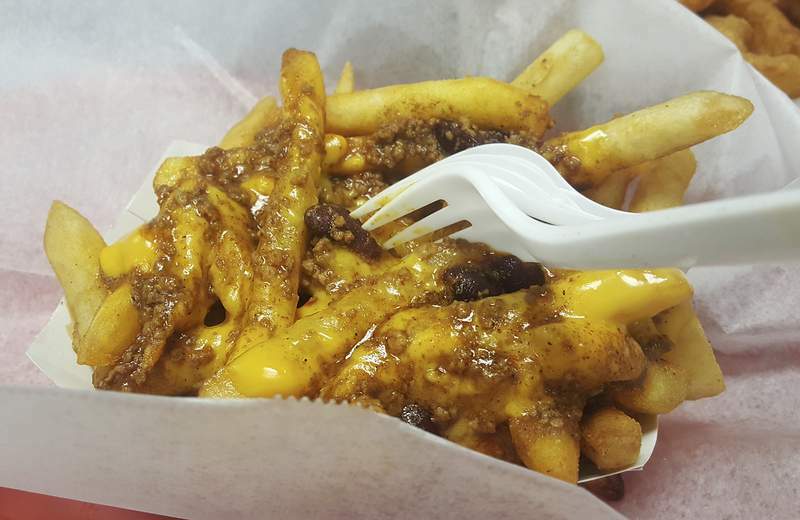 Chili-cheese fries from the Coney Dog Cafe at Lima and Dupont roads. 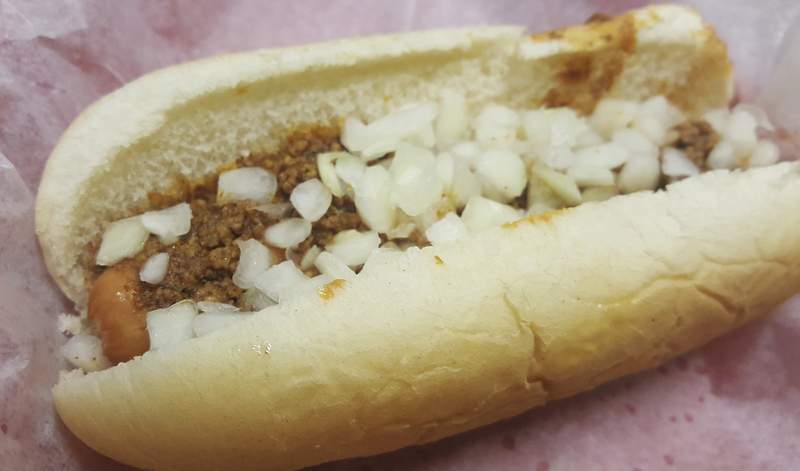 A Coney Dog from the Coney Dog Cafe at Lima and Dupont roads. 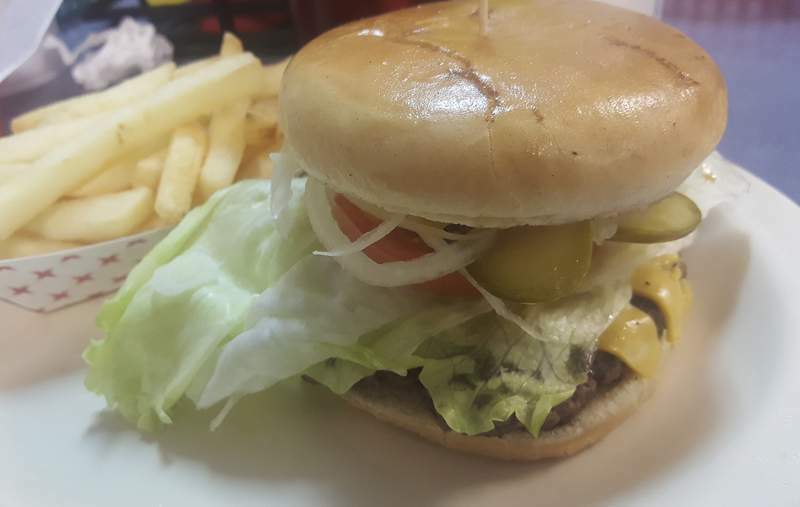 A half-pound burger from the Coney Dog Cafe at Lima and Dupont roads. 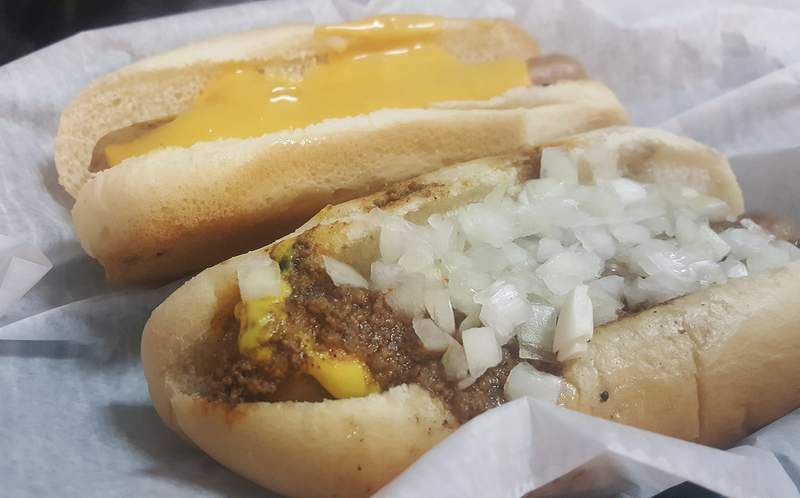 A hot dog with nacho cheese, top, and a Coney dog with nacho cheese from the Coney Dog Cafe at Lima and Dupont roads. A cheeseburger slider from the Coney Dog Cafe at Lima and Dupont roads. 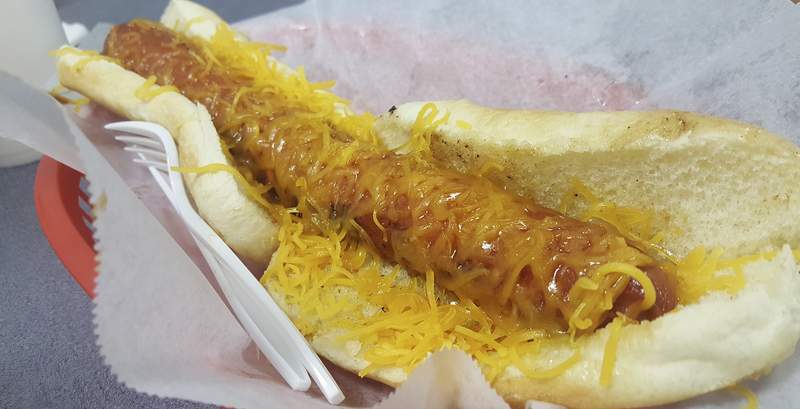 A half-pound beef hot dog with shredded cheese from the Coney Dog Cafe at Lima and Dupont roads. The Coney Dog Cafe at Lima and Dupont roads. 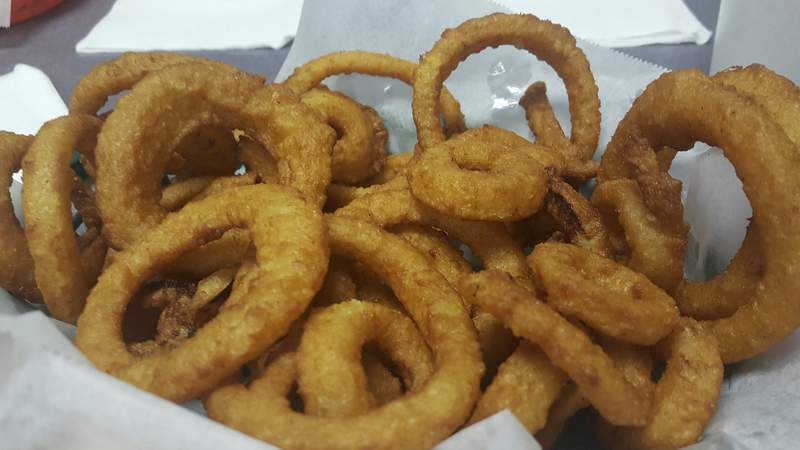 Onion rings from the Coney Dog Cafe at Lima and Dupont roads. A breaded chicken sandwich from the Coney Dog Cafe at Lima and Dupont roads. 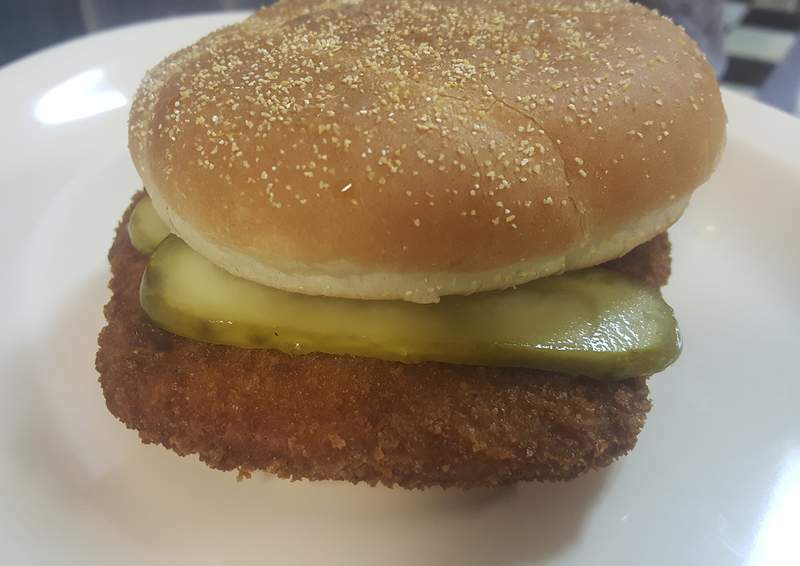 Breaded tenderloin from the Coney Dog Cafe at Lima and Dupont roads. 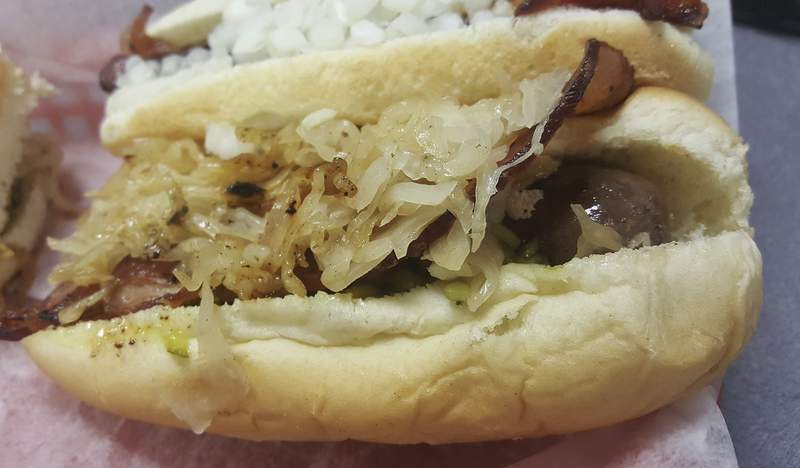 A New England-style bratwurst from the Coney Dog Cafe at Lima and Dupont roads. 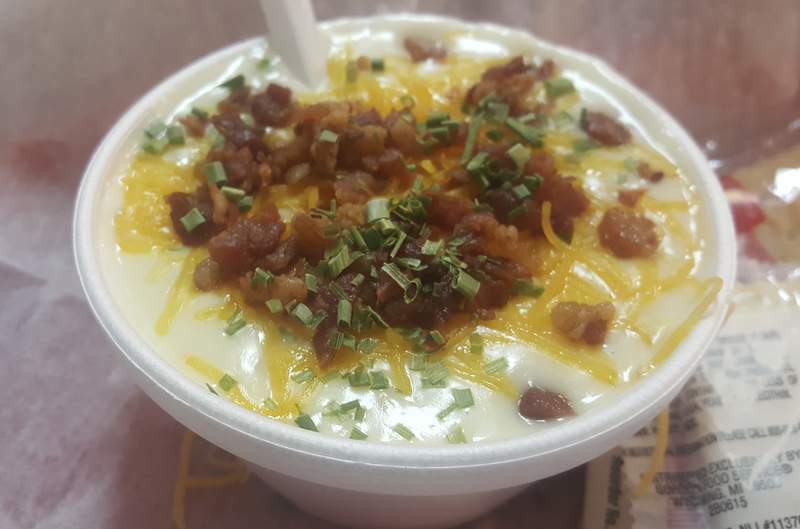 Loaded potato soup from the Coney Dog Cafe at Lima and Dupont roads. Now that it is officially spring, we can think of all things that come with it – flowers, the sun, baseball. And hot dogs. It is the prototypical warm-weather food, especially at the ballpark, and it is also quite a popular choice year-round in the Summit City. Of all of the places that serve the encased meats, there is one that keeps drawing me back more than any other, with the exception of the legendary place downtown. And I must not be the only one who likes the Coney Dog Cafe, which started in New Haven, because it expanded to a second location at Lima and Dupont roads. I was eager to see whether it lived up to what I loved about the original. What I found was that the new spot, once home to Dawson's Dogs, was much different in a lot of ways but still the same when it came to what was important. The strip-mall space it occupies has a cleaner look, which doesn't have the character or charm of the original. But that more corporate look probably is more comfortable for the masses. It has a rustic-modern design with nifty stainless steel sheet siding on the walls and a black and white checkerboard tile floor. The menu mirrors the original place with a variety of topped hot dogs, sliders and other sandwich options for those who, for some reason, would go to a hot dog joint and not want a hot dog. The original coneys were as solid as they always have been. The sauce is thicker and meatier than the legendary spot downtown and has a little more peppery zip, but it is not too spicy for any palate. It has a unique background flavor, too, that I still cannot crack the code on, though I suspect some cumin is involved. The coney dogs can also be altered in many ways to add interesting wrinkles. Coney Dog Cafe offers shredded cheese or cheese sauce – or both, if you really like cheese. And if the time and day are right, you can ask to have any dog deep-fried instead of grilled so the exterior gets a little snappier or, better yet, have them leave the hot dogs in until they burst open to become “rippers” – a variation that is pretty popular out east. 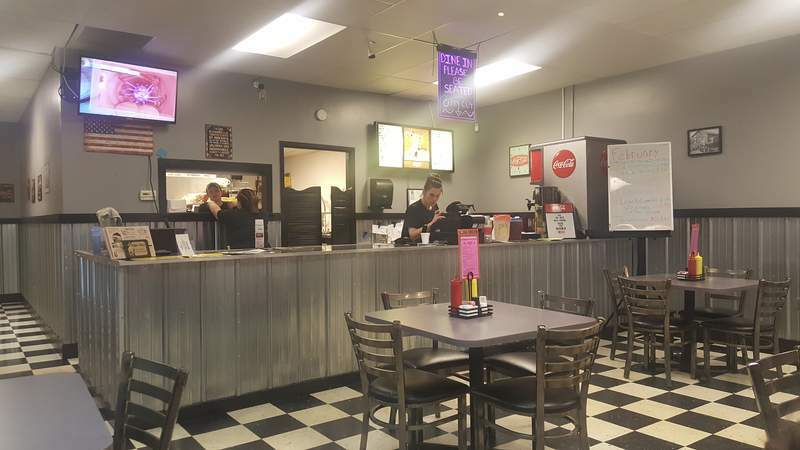 Owner Marty Compton – one of the most genuine, hands-on restaurant owners I have ever been served by – also added the option of a giant coney a handful of years ago when he started offering half-pound beef dogs. Compared with the rest of his very affordable menu, they are a pricey option at $6.99, but the dog is not just for show. It is a really good beef wiener and is way better than his standard beef dog. 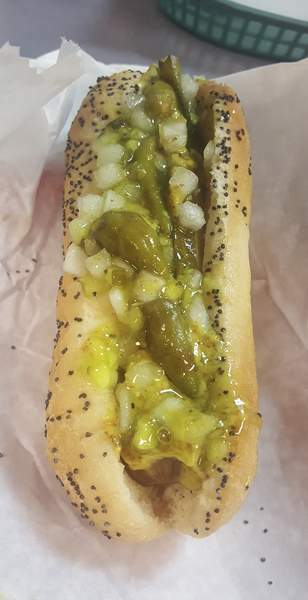 I had that standard beef dog when I tried the Chicago Dog and was a bit underwhelmed. The dog was small and rather unmemorable, and though it had the signature ingredients – a pickle spear, bright green relish, mustard, tomato, onions, sport peppers, a sprinkle of celery salt and a poppy-seed bun – there was only one small sliver of tomato on mine, and part of that bun was a little stale. Next to the cheese, the best thing to add to one of the dogs is bacon. It was perfectly cooked to add just the right crunch. The Western Dog was my favorite bacon-included treat. It had enough of the crispy bacon to cover the entire dog and had a drizzle of tangy barbecue sauce and chopped onions. I had mine deep-fried, too, which added even more texture. Next time I will be adding some cheese to take it to even another level of tastiness. The side options at the Coney Dog Cafe were limited – fries, onion rings, chips, soup and nachos – but all were worthy of trying. The chili was great when ladled over a basket of crunchy french fries, along with some nacho cheese sauce. The chili was rich but mild in spice, with not too many beans. The fries held up well under all the sauce, and I would have it again – maybe even with coney sauce instead of chili. The onion rings were coated in a crunchy batter, and I kept going back for more because, though not hand-made or unique in any way, they were just darn tasty. 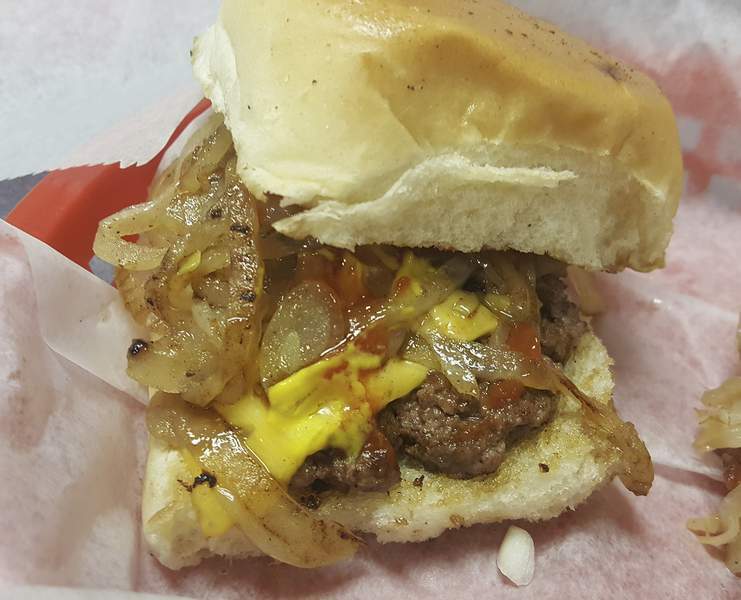 The sliders share similar traits with another legendary coney place downtown, as they are loaded with grilled ribbon onions. The patties were much meatier than most standard sliders, and the buns were the perfect vessel as they were super soft. I preferred the sliders to the half-pound cheeseburger, which was on special during one visit. The bigger burger was plenty juicy and fine on its own, but it really needed those grilled onions to impart flavor, so I wouldn't get it again unless I added them. 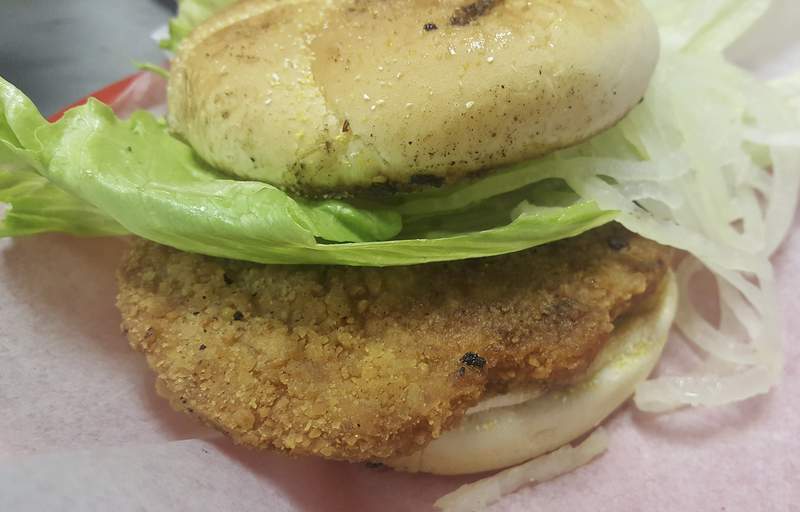 The breaded pork tenderloin and breaded chicken sandwiches followed suit. They were OK but not worth making a trip there to try. Both had gritty, crispy breading and had similar cubed, cutlet-style texture, so they weren't overly meaty. The only tubed meat option that I was not too excited about was the bratwurst, which I had New England-style with sauerkraut, bacon, relish and spicy mustard. It was an OK sausage and I loved the spicy mustard, but I'd just as well have a hot dog. And I will keep having hot dogs from the Coney Dog Cafe because it is such a solid option. The service was splendid. The folks who work for Compton obviously enjoy working there, and it is clear they are passionate about the food because they will enthusiastically tell you what they think is best if you ask.